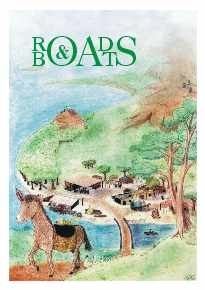 Roads and Boats is our oldest classic. We reprinted the game 4x so far. The latest print run has sold out! The game can be played by two to four players, but it can also be used as a one-person puzzle. Material for a fifth and a sixth player is available in the &Cetera expansion. The basic game contains a rule and scenario book in English and Germand, a pile of hexagonal terrain tiles, 120 means of transportation from donkeys to steamers (wooden pieces), 75 walls (little woorden rods), 4 research boards, 28 discovery stones (glass), a wonder of the world with 193 wonder stones (cardboard), 18 mines + bags, 115 factories (cardboard), 600 goods (cardboard) and several other parts. The fourth edition is very similar to the third edition except: the counters have be printed on both sides (gold and iron are black on the backside); the stickers have been upgraded to last longer; and, hopefully, we have a foldable plate instead of a rolled-up one.